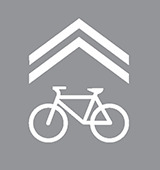 Do You Know what That New Painted Bicycle Sharrow Symbols on the Roads Mean? Do you know what this new symbol painted on Rainbow Dr. between Stelling Rd. and Bubb Rd. means? I asked my wife and she guessed that it meant for cars to watch out for bicycle riding to the right next to the curb. This segment of street is too narrow for a painted bike lane yet is designated by the city of Cupertion to be a formal bicycle route. This sharrow symbol with a bicycle symbol underneath mean that bicycles share the same road space (center of the road) as bicycles. If a car come up behind a bicycle they must follow at a safe distance behind the bicycle. In other word bicycles sharrow (share) the same road space as cars. I think my wife is not alone in not knowing what this symbol means. I’m willing to bet that at least 80% of drivers in our city do not know for sure what the symbol means. The problem is that many people may have many interpretations of what this symbol means. This ambiguity could cause a more dangerous condition than in the past. The city needs to make it clear what driving symbols mean to remove any ambiguity in interpretations. This entry was posted in Article, Examples and tagged ambiguity, interpretation, share the road, sharrow symbol. Bookmark the permalink.